Children's art is so variable. There is the gentleness of the illustrations in Winnie the Pooh and the sharpness of the superhero comics. Each artist seems to have an identifiable style no matter what the images. I have long admired the wall murals painted in children's bedrooms by Jessie Phillips. She may be my niece, but she is also very talented. One of my favorite picture of hers was painted on the bedroom wall of her daughter, then a newborn. I photographed the entire wall and cut pieces of the mural out of the image for use as clip art. These are some of my favorite clips, and I am very grateful for her permission to use them. Almost sadly, Jessie has moved into a larger house, leaving behind those fabulous murals. She has painted other murals on her new walls. Recently I met another young artist, Josh Pittser. He paints superheros known, to date, only to his friends and family. 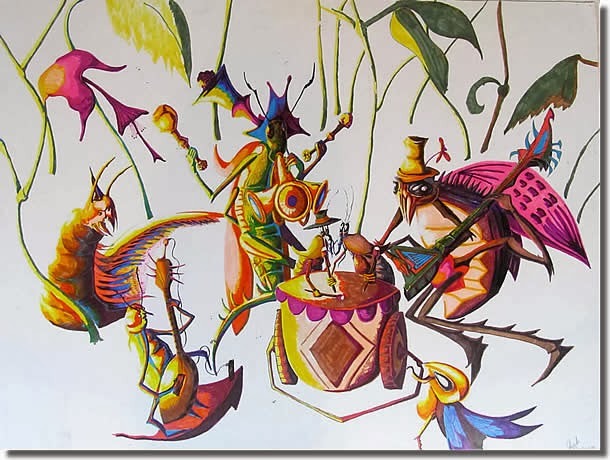 He also paints insects at play. When I saw the painting I call Bug Party, I knew I had to see it next to what I call The Inchworm. 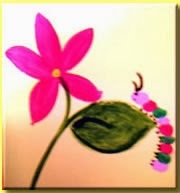 Look at the caterpillar in each painting and compare them. Both are wonderful for kids. I eagerly await the advancement in the careers of both of these artists that will produce more of these imaginative works! I look forward to the prints that will eventually be available for sale. I may not have any kids to decorate for--even my grandchildren are growing up fast--but I want a few prints anyway. Both of these young artists live in Brazoria County, TX. Each are painting part time as they work to help support their families and raise their children, but their busy lives do not stop them from painting when they can. Should you wish to contact either artist, email me and I will pass on the message. Note: Names of the paintings are mine, not that of the artists. I think Jessie calls the caterpillar a bookworm. I do not know what Josh calls his painting. Both of these images are trimmed, reduced, shadowed, and sharpened, etc., a bit from the original photos. I took the photos, so any problems with the images are due to my skills, not those of the artists. Both of these images will stimulate a child's imagination, whether that child is pre-schooler or teenager. Whether you are the parent, teacher, or the babysitter, you can focus on and advance the child's skills of expression by asking the child to do an activity with the pictures. Here are some suggested activities. Don't worry about right answers, except for "hitting somewhere in the ball park" with the science focus; remember that the moment is for encouraging imagination and expression. Ask questions about what is happening in the pictures. Ask the child to write a story about one of the pictures. Later ask for a story about the other picture. Allow for flights of fancy that can be the beginnings of an appreciation for science fiction and/or fantasy. Ask about the memes or symbolism in the images. Ask what the meme means personally. Ask the child to draw and color a similar image like the one that is his/her favorite of the two. Note: Visit one of my websites, Valerie Coskrey's Classroom Tools and Ideas for more Teachable Moments. There is a whole page on encouraging students to write using visual memes--and more images to use. Visit my new blog Talking about This and That, the official blog of the resale/thrift shop Mertie's This and That in Brazoria, TX. Well, it isn't really my blog, but I am managing it and writing it. One of my posts focused on renovating furniture. In this post, I report on my chat with a local artisan who refinishes furniture with a Texan style. In fact, he calls his shop Texas Attitude. Donn Correll turns junk finds into beautiful items. He not only refinishes furniture, he also crafts parts to replace damaged sections and to create that Texan look. If you want to contact Donn about his furniture hobby, visit my website and send me an email. This dresser with shelf is an example of Donn's work. How he altered the original is part of the blog post. I hope you enjoy the articles. They reflect a new business that my husband and I have started to supplement our retirement funds. You can read more about this in Valerie's Memos, which will serve as a newsletter for our new company Coskrey Biz, at least for now. There could be more articles to Valerie's Memos separate from a newsletter function, but as a newsletter, it works. I used another blog as a newsletter once. To keep articles separate, I posted a newsletter listing in a Page. Took some extra work, but I wanted to know if a blog subscription list was more effective than a mailing list. Probably not, but until the mailing grows, it will suffice.